For Bushie, coming back to his room at Milroy Lodge after a long day of treatment is something he can look forward to now thanks to new recliners purchased with Dry July funding. Bushie has been staying at Milroy Lodge for nearly 3 months while he receives treatment in Perth for lung cancer. The lodge is one of two accommodation facilities run by Cancer Council WA that sees 5,000 country cancer patients stay with them each year. 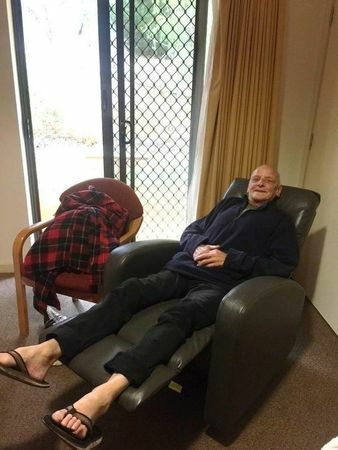 The funding received from the Dry July campaign in 2017 means that he and every guest staying at the lodge can relax in the comfort of a new leather recliner. “It’s beautiful to come back to a comfy armchair. I’d like to thank Dry July very much. I see that every room has got one and I am blown away that these are here”.